Single seat node-locked license only. Make informed business decisions by taking Location Intelligence to the next level! 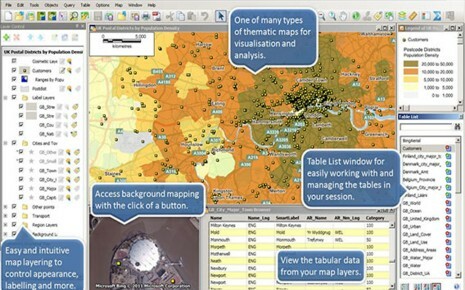 Create thematic, multi-layer maps and labels to visualize tabular data using the world's premier desktop GIS and mapping application. Now includes 32-bit and 64-bit install versions. Save time and get more done quickly with the improved performance for object processing operations as a result of using multiple cores/CPUs. Access more intelligence data than ever before with additional data format support. Easy to learn user interfaces for the software novice or expert– the ribbons and galleries make it easy to find and use the functionality you need. Support for multiple monitors will help improve productivity. Single seat, node-locked license. Now includes 32-bit and 64-bit installation versions! Make informed business decisions and understand your customers better by taking Location Intelligence to the next level! Sales coverage, revenue and growth projections, expansion planning, target marketing, routing and scheduling, cost analysis and containment…no matter your industry or business size, this software will help you effectively analyze your customer geographically to help you make confident business decisions. 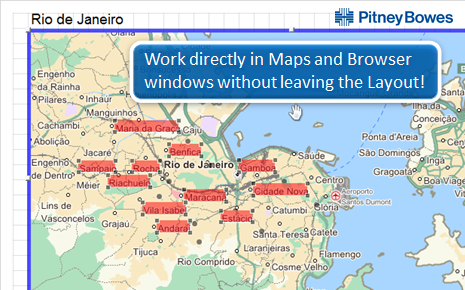 MiPro v15.0 makes it easier than ever to print and share maps, provides improved performance and a host of other benefits. MiPro gives you great control over the appearance of scalebars - allowing transparent backgrounds and borders and optimizing more space for map display. The Legend Designer, introduced in v11.5, provides control over the order of objects within a frame, automatic word wrapping for long text and resizing of style swatches for individual layers. Objects within the layout window can be quickly aligned. MiPro v15.0 continues to feature exceptional labeling capabilities for improved productivity. Smart algorithms allow users to place more curved labels on a map automatically. Options are also provided to fall back to rotated labels where lines are too jagged or curved labels will not fit. Curved labels can be moved by clicking and dragging them to a new location. The algorithms also provide intelligent placement of labels for polygons, automatically determining the best location and size for individual labels on densely populated maps. 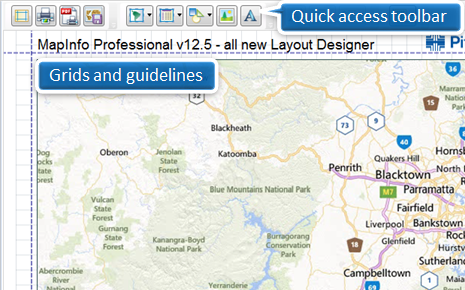 MiPro v15.0 continues to be the world's most powerful easy to use GIS. Tools such as Compare Table Structure allowing for users to compare and edit data in multiple tables simultaneously, the PolyBuilder tool for automatically creating polygons from digitized linework and the Quick Translator tool for getting non-native data in and out of MiPro, mean complex operations are made straightforward, saving valuable time. MiPro v15.0 takes advantage of multiple processor cores to accomplish buffer, split and other object processing tasks faster than ever. 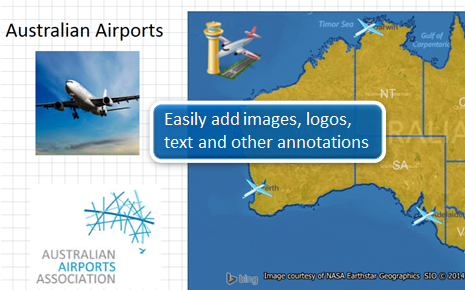 Import and export data in the ESRI GeoDatabase format as well as Geography Markup Language (GML) versions 2.1.1, 3.1.1 and 3.1.2. Now includes 64-bit installation version! You will be able to install and use this version with the same serial number and activation code you used for the 32-bit version, so installation will be quick and easy! This new user interface will take MiPro renowned ease-of-use to a whole new level! Watch the video below to see the new 64-bit New Ribbon User Interface.